Stopwatch+ is a simple yet delightful time-keeping app. With its high reliability, it allows you to keep track of any event, as it works in the background, under the lock screen, and even if the phone is completely turned off. Beautifully Modern, from app icon to page transitions, it?s as intuitive as a native application. Optimized for Windows Phone 8, it supports Live Tiles, Kid's Corner, instant launch, instant resume and fast app switching. The UI is optimized for WVGA, WXGA and 720p resolutions. If you love precision, and enjoy a wonderfully minimal experience, you'll love Stopwatch+. - Live Tile: small, medium and wide. The icon changes when the stopwatch is running. - Sharing: support for sharing via messaging, email and social networks. - Idle screen detection: keep the screen on while the stopwatch is running. - Button feedback: vibration, beep, or vibration + beep. - Clipboard: easily copy laps to the clipboard, allowing you to export them. 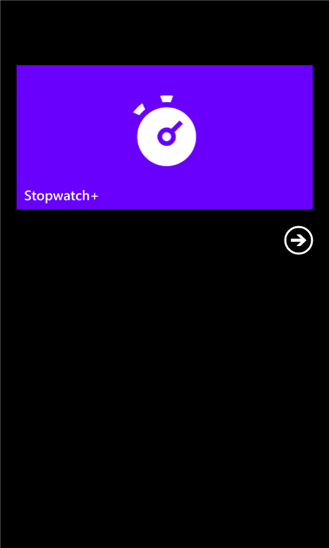 - Settings: Live Tile color, keep screen on while running, button feedback, and confirm before clearing. - Stopwatch session with unlimited number of laps. - Added support for landscape mode. - New setting: orientation lock. - Added support for Italian language.